Despite popular belief, the re-casting of Megan Fox was not the reason I went to see this film. I do have to admit her role as Mikaela Banes in Transformers was successfully transferred once again to her return role as April O’Neil. But, no, the real reason was the local ties here in Maine, which is Portland’s co-creator of the original comic, Kevin Eastman. From the idea of bus kicking turtles in ’83 to the first pages created at Mirage Studios in ’84 his collaboration with Peter Laird gave us our first taste and so the games began. Since then fans continue to be enthralled with this quartet of raw justice. This sequel was announced just two days after TMNT (2014) was released. 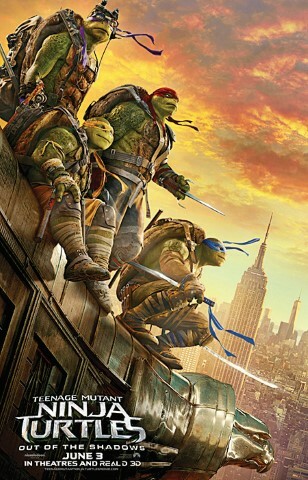 Here these four reprise their roles when they are called upon once again to restore justice and protect New York City, their home, from the key player of The Foot Clan. Yes I am referring to Shredder, this time played by Brian Tee (Wolverine 2013). He is menacing and a true match for the fearsome foursome. Well, almost. But their challenge is two-fold because they also come into conflict with T.C.R.I. scientist Dr. Baxter Stockman (Tyler Perry) who hires Shredder to create mutants of his own to even the score. Meanwhile, the Turtles discover a Retro-Mutagen and hope manifests they can become humans following an extraterrestrial invasion above New York City led by the Dimension X inhabitant known as Krang. With Krang's Invasion, the Turtles are of course are mentored with precise wisdom in preparation to their fight by their Master, Splinter. Just like the proceeding films, that wisdom would strengthen their resolve. Success always seems to be contingent on the out-of-the- ordinary. This was cleverly introduced through the use of theme music from Ocean’s Eleven. You’ll get it. When you add up all the elements that went into this production it is plain to see why it is still iconic. Even with the replacement of Director Jonathan Liebesman by David Green (Earth to Echo) the execution of the scenes remained as effective. Kudos also go to Producer Josh Appelbaum (executive producer of several episodes of Zoo television series) and Phil Barrie (Batman vs. Superman: Dawn of Justice) 2016 for the sound editing of this film. It’s difficult to not to entertain with this entire cast and crew.